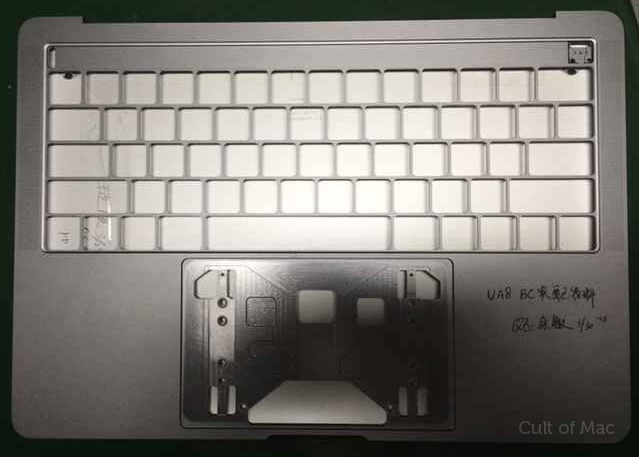 Apple's suppliers have already begun providing it with parts for an upcoming 13-inch "MacBook" update, according to a paywalled report from China's Commercial Times summarized by DigiTimes. Notebook hinge maker Jarllytec reportedly started shipping metal injection mold-made (MiM) hinges to Apple in May, said to be destined for a 13-inch MacBook. The MacBook in question is likely to be a future revamped 13-inch MacBook Pro, which past rumors suggest will use MiM hinges. Metal injection molding is a technique used to create small, intricate metal parts. Apple is rumored to be using hinges crafted this way to save space, as the next-generation MacBook Pro models are said to be ultra-thin. The same report suggests Jarllytec will begin shipping hinges for 15-inch MacBook models in the third quarter of 2016, raising the possibility that Apple will stagger the releases of the redesigned MacBook Pro, first introducing a 13-inch model and following it up later with a 15-inch model. If Apple already has hinges in hand for a 13-inch MacBook Pro, it would perhaps be ready to debut in the next couple of months. We've already seen a chassis said to be for the 13-inch MacBook Pro, supporting the notion that it is perhaps already in production. We are not expecting to see MacBook Pro announcements at WWDC, but rumors have suggested Apple will debut its next-generation MacBook Pro machines during the fourth quarter of 2016. Should Apple be planning to stagger the releases, a 13-inch model could come in September and a 15-inch model could follow in October or November should it not be ready to launch at the same time. Predicting Apple's plans for the 13 and 15-inch MacBook Pro is difficult because there are a lot of confusing rumors about the two machines. Many of the rumors about the devices have referred to them as simply "MacBooks," and that ambiguous naming is further confused by a report from Ming-Chi Kuo suggesting Apple is also working on a 13-inch MacBook that would be sold alongside the 12-inch MacBook. Distilling the rumors down, it's clear there are new MacBook Pro machines in the works, but figuring out a more concrete release date won't be possible until we have more information to work with. In addition to being ultra thin with a MacBook-style design, Apple's next-generation MacBook Pros are expected to include an OLED touch panel that will replace the function keys on the existing MacBook Pro. Touch ID may be included, and rumors suggest the bar will be dynamic, changing the available keys based on the app in use. This touch panel will need to be deeply integrated into OS X, so additional hints on the upcoming MacBook Pro may be found in OS X 10.12, releasing to developers next week. I have a feeling they will announce the update, but it won't ship until September. They should at least let us know they're still making computers. The longer Apple takes to update the MacBook Pro range, the more likely it is that the company will dump Intel for ARM. Or skip Skylake. Hopefully a quad-core option & dGPU in the 13". And please keep MagSafe! The 17" MBP was a lumbering, overpriced, behemoth of a laptop. It's not coming back. An Alienware 18" is a lumbering , behemoth of a laptop, the MacBook Pro 17' was 2 inches bigger than the 15, with the rest of the dimensions in proportion, also the best laptop for pros in my opinion. Any hinges for a 17" MacBook Pro? Apple should never have stopped selling it. Bring back the Sd slot. Okay this might sound ridiculous, but for some reason I'm going to be really devastated if they opt for the glossy Apple logo on current MacBooks and not the iconic glowing Apple logo that lights up. Also, I'm going to be really upset if the function keys are more advanced than the entire screen itself, which should include OLED and optionally touch as well. I am so sick of Apple milking consumers, their time between updates gets longer and longer. Their arrogance knows no bounds. So no new Macs at WWDC :( Why Apple?!? Haven't we waited long enough? Just take my money already! I gave up waiting 2 years for a decent MBP update, and I bought a Windows laptop. The delays in manufacturing modern hardware indicate a huge failure of leadership at Apple. They better get a move on assembling these things if I'm to pick one up next Tuesday.